The plug-in thermostat turn space heaters/window AC into programmable and more efficient. Easy to operate and simple plug into a socket for easy installation. The plug-in programmable thermostat allows the user to setup the desired temperature for their room. One year warranty against defects in materials and workmanship under normal use. Stiebel Eltron's surface-mount CK Trend heater is made in Germany. Perfect in any location, this quiet fan heater quickly warms an area or maintains a comfortable temperature. Perfect for both retrofit and new construction, the downdraft design heats a space evenly. A CK Trend can easily replace an older flush-mount heater, and is ideal for bathrooms, basements, offices, playrooms, 3-season porches, cabins, campers or RVs, and mobile homes. The adjustable thermostat to control temperature is located on the top of the CK Trend. The CK Trend's frost protection setting will maintain above freezing temperatures in an appropriately sized space. The strong external casing is plastic, and the entire heater is designed to have its components recycled at the end of its useful life. Stiebel Eltron is a world-leading German manufacturer of technically superior products since 1924. 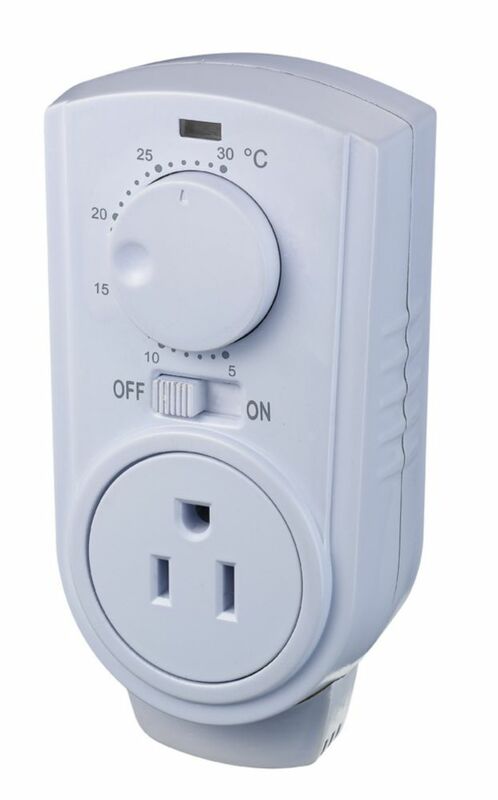 Plug in thermostat for portable heaters and air conditioners The plug-in thermostat turn space heaters/window AC into programmable and more efficient. Easy to operate and simple plug into a socket for easy installation. The plug-in programmable thermostat allows the user to setup the desired temperature for their room. Plug in thermostat for portable heaters and air conditioners is rated 4.3 out of 5 by 16. Rated 3 out of 5 by Michael from Clunky purple thermostat. This unit is a peculiar colour, not white, not purple and it does not match the heater. It does do its job even if quite clunky looking. I would prefer to have been able to plug the heater in the side or bottom of the thermostat instead of the front to make it appear a little more streamlined and not have the plug and cord protrude so much. The operating lights seem counter intuitive, green for heat and bright red for off. Rated 4 out of 5 by Mary F from Helpful when using timers & outdoor heated mats Temperature scale is slightly less accurate than the plus or minus 2 degrees. Although it states for indoor use, I use it outdoors for my heated mats & it works well. It’s not directly exposed to the elements. Overall a very good product. Rated 3 out of 5 by Dave from Just ok. The baseboards throw a good amount of heat but we bought them foe our cottage so we could use them with the app. The app is disappointing to say the least and they do not control the baseboards accurately. Rated 5 out of 5 by KristaL from Works great! I have this in my “parrot house” to keep steady temperature during the winter. It’s worked fantastic! Rated 5 out of 5 by Andrew from Exactly What I was Looking For. I had been looking for small heaters with thermostat control I could set to a specific degree. They are hard to find and the ones that have thermostats are expensive and high energy users. I found this plug with a thermostat which is better because I can use it on anything. It is well made, works great and it's controls are simple and easy to use. Perfect for my needs. I bought a couple of more for use on more items. Rated 5 out of 5 by WozGuy from Handy for out of the way places Handy for out of the way places, for things like heaters, or heat lamps that don't have built in thermostats. Rated 5 out of 5 by Kenneth from Good product. I ordered this thermostat last month and received about two weeks later. It works good and simple. All as my expected. Thanks!